Every morning this week after I got up at 5:00 am, EDT, here on Cape Cod, MA., I found myself logging on to iTelscope.net to check out the weather conditions. The past five days in a row the skies have been clear. To my surprise, I would find that there were many telescopes available to use as well. My favorite remote robotic telescope, T-11, the Planewave 20" (0.51m) CDK was available on the mornings of Wednesday, March 13th as well as this morning. NGC 4565 - Spiral Galaxy in Coma Berenices imaged by Michael Petrasko - 300-second exposure. On Wednesday, I captured this image of the spiral galaxy, NGC 4565 (above) in the constellation of Coma Berenices. The exposure was 300 seconds and was processed in FITS Liberator and slightly colorized in Adobe Photoshop. 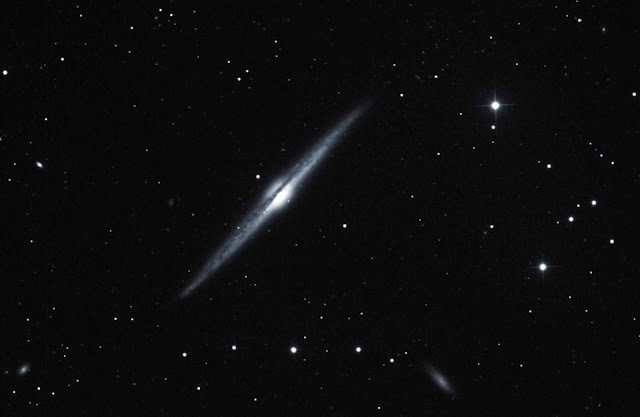 NGC 4565 (also known as the Needle Galaxy or Caldwell 38) is an edge-on spiral galaxy about 30 to 50 million light-years away in the constellation Coma Berenices. The 10th magnitude galaxy sits perpendicular to our own Milky Way galaxy and is almost directly above the North Galactic Pole (in the same way Polaris is located above the Earth's north pole). It is known as the Needle Galaxy for its narrow profile. First spotted in 1785 by Sir William Herschel (1738–1822), this is one of the most famous examples of an edge-on spiral galaxy. This galaxy is visible through small telescopes and some sky enthusiasts consider NGC 4565 to be a prominent celestial masterpiece Charles Messier missed. M63 - Sunflower Galaxy in Canes Venatici imaged by Michael Petrasko - 300-second exposure. This image of the spiral galaxy, M63 also known as the Sunflower Galaxy in the constellation of Canes Venatici, was acquired this morning at 3:25 am, MDT. The exposure time was the same as NGC 4565 (pictured above) at 300 seconds. I have concluded that 1 exposure at 300 seconds on galaxies like these is more than sufficient to capture detail to conduct scientific research such as extragalactic supernova search. The Sunflower Galaxy was discovered by Pierre Méchain on June 14, 1779. The galaxy was then listed by Charles Messier as object 63 in the Messier Catalogue. In the mid-19th century, Lord Rosse identified spiral structures within the galaxy, making this one of the first galaxies in which such structure was identified. In 1971, a supernova with a magnitude of 11.8 appeared in one of the arms of M63.